People like to measure and quantify, it’s just in our natures. Runners are no different – we like to measure our running success. Did my finish time meet/not meet my goal? This may be straightforward and easy to determine, but it way oversimplifies us as runners. I’ve written before about how I’m not a finish time focused runner. Getting faster or finishing under a specific time (unless I’m acting as a race pacer, of course), just isn’t something that inspires me. This can sometimes make determining how a race went a bit of challenge. And even if you like to focus on pace or finish time, focusing on a single metric may not tell the whole story of a run or a race. 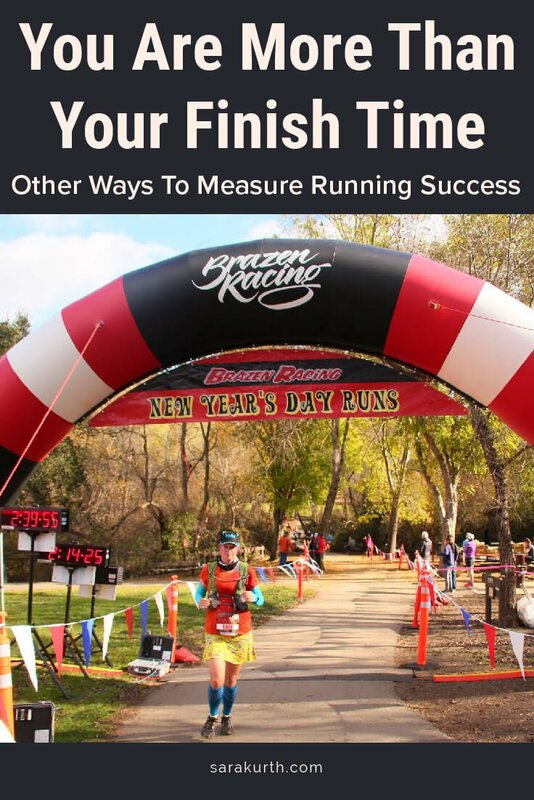 I know the default measure to gauge running success is, and will likely always be, time. But it is far from the only option. Here are a few other ways to determine the success (or not) of a race or an everyday run. Some of these may be more relevant to you than others. For me, ‘did I win’ isn’t a measure I’ll ever likely use, but it’s relevant for some. I know some of these measures are ‘mushier’ than others. ‘Did you push yourself’ may not be as quantifiable as finish time, but, chances are, if you are honest with yourself, you know when you did (or didn’t) do it. While speed or pace may not be the only way to measure success, it is both easily determined and predicted, which makes for much easier goal setting. Did you meet/exceed your finish time goal? Did you meet/exceed your pace goal (either per mile or per split)? Did you run with negative splits? Negative splits are when you run the second half of a run faster than the first half. Did you PR the route/course/race? Did you beat previous runnings of this race/route? If you track other physical measures, such as running cadence or heart rate, did you meet/exceed the goals you set for those measures? I’m not a fan of competitor comparisons to determine the success of a run. I’ve come in first and I’ve come in last (or very close to last) in my age group with very similar times and paces. Comparison measures tend to say more about the other people who raced on a given day than it says about you. Be aware of who you are comparing yourself to if (and when) you use comparison measures. Did you win your age group? Did you beat your (hopefully friendly) rivals? Did you beat that one person you kept leapfrogging during the race? There usually is someone who you kept running into/ passing during the race. Often in the last mile, I’ll take special note of those around me and pick a person or two that I would like to beat. Did you beat the pack? Did you finish in the top 25%, 30%, 50%, 80%? Pick whatever measure is relevant to you? These are the mushier measures, but when you are honest with yourself, they do the best job of telling you how you are doing. Did you finish? For some runs and races, seeing it through to the end is a victory in and of itself. How did you handle stress or when something went wrong (or not according to plan)? Did you give up or stop pushing yourself at any point in the run? Did you conquer your demon(s)? Which little voice in your head did you listen to more, the good, supportive voice, or the evil voice that says you can’t do it? Did you conquer that hill (or whatever course challenges there may have been)? Do you feel like your prepared properly? Was your hydration or fueling on point? These are also mushier measures and are best to determine success over time or as an overall trend. They acknowledge that for many of us, running is a way to stay in shape for life. Walk/run a certain distance without having to rest? Do the things I want to without extra planning or consideration? Some runners want to maintain a level of fitness so that they can run a 5k or half marathon with short notice. What about you? 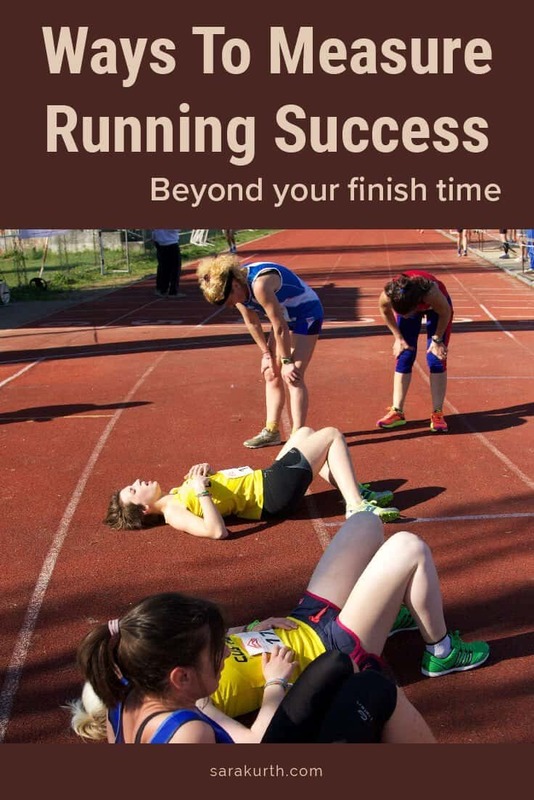 Are there any other ways you measure running success? Awesome pointers Sara. I especially love the Speed/Pace and Comparison to Yourself measures! The practical measures at the end is what it’s all about. Knowing your why can be a big motivating factor. Thanks! My latest practical measure is ‘am I fit enough to not get winded walking up several flights of stairs’. I’ve been running for 20 years and I still can do that! Thanks for checking out my site! I’m glad you found it helpful. Happy running!